I was going to write an in-depth article this morning about Infiniti's new implementation of owner reviews on its shopping site http://www.infinitiusa.com. 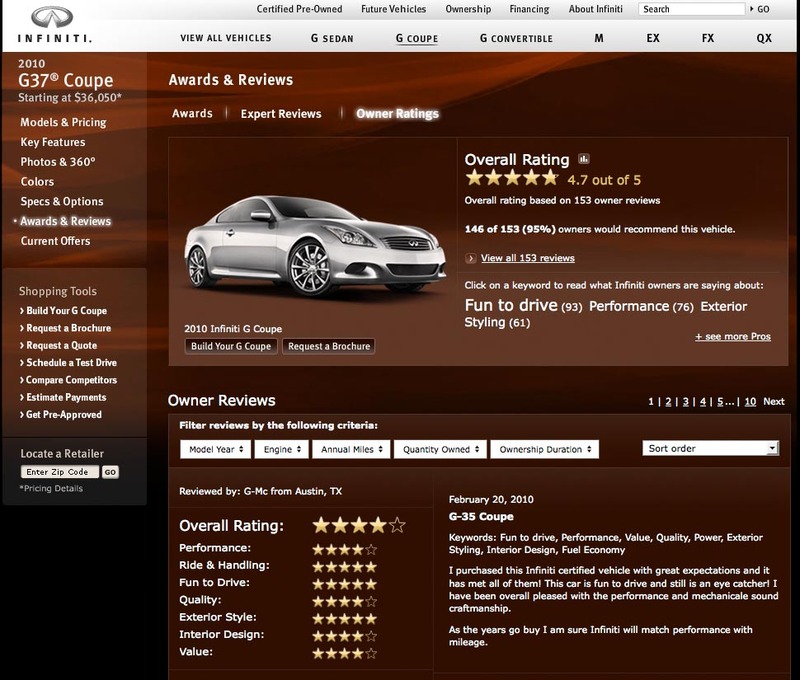 The use of consumer reviews on an OEM website is the first implementation I have seen from a U.S. automaker. 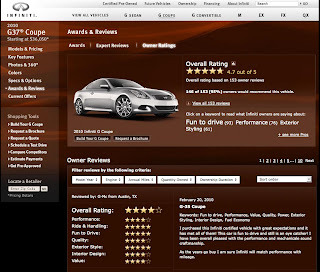 So Infiniti has decided to allow "owner reviews", not consumer reviews, but owner reviews. The difference is the reviews cannot be entered by just anyone. They have to entered by some who currently or in the past owned an Inifiniti. At least that's what I believe. I tried entering an owner review on their site, but there is no place to do such a thing. I click on "Did you find this review helpful?" On one of the existing reviews and am told, "We're sorry, you must be logged in to submit feedback. Please go back and log in prior to submission." Okay, but where do I log in? I search the navigation, looked all around the reviews section, and I even created a owner profile using a VIN number and providing some personal information. I was able to setup an owner account and log into the owner's section, but still there was no way to submit feedback on any vehicle review page. As it stands now, I was completely unable to figure out how an owner enters a review on Infiniti's site leaving me to wonder where are these reviews coming from? I checked Yahoo Auto's since the review format looked very similar, but no luck. 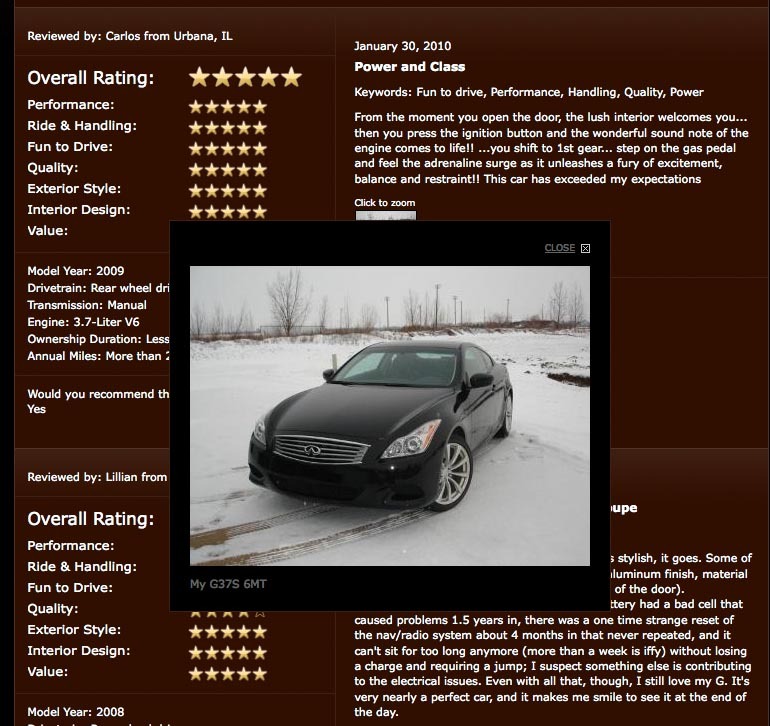 It is interesting Infiniti is showing owner reviews on its site. I browsed several models and found, unsurprisingly, that most people who spent $40k-$70k on an Infiniti felt good about their decision and wrote a positive review. There were a few issues people had with their cars and some reviews gave 3 instead of 5 stars on a few criteria. 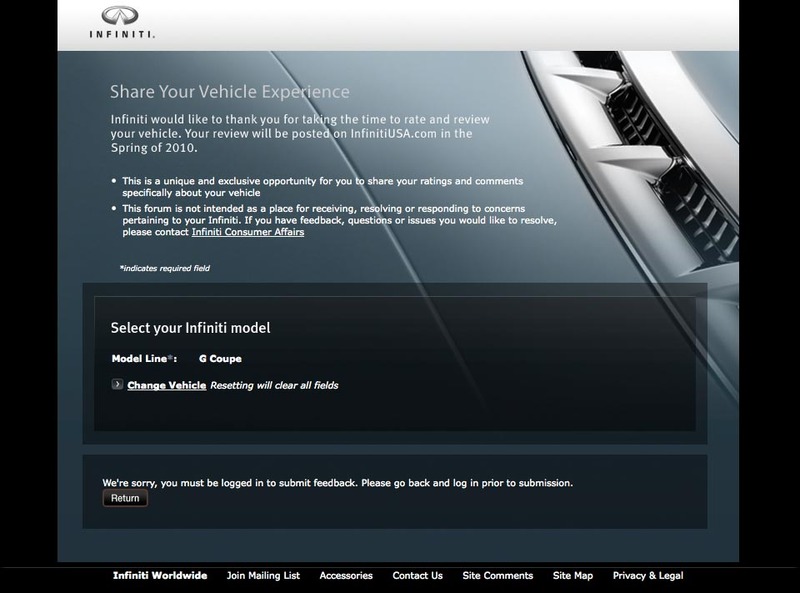 I'm also quite certain that reviews are moderated by the company, meaning they have to be approved before going live on Infiniti's site. I wanted to test this idea but with no place to enter a review I was unable to see how that process works. Infiniti's use of owner reviews is an interesting one and research from other shopping experiences (shoes, electronics, etc.) In one 2009 study, a U.K. electronic parts supplier found that reviews increased conversions by 14.2%. Other examples exist in e-commerce research showing conversions/transactions do have a positive increase on a site when reviews are there; though, I have seen studies that it only applies to products with favorable reviews. Products with mediocre response tend to have lesser transactions. Well it will be interesting to see who else follows Infiniti's lead or if others follow at all. Personally, I feel consumer reviews for cars exist in so many places where online auto shoppers already are, that providing them on the OEM site is rather pointless; though, I'm sure some disagree with me. This I feel is a very healthy practice that we will see growing in the auto industry with Infiniti USA taking the lead. 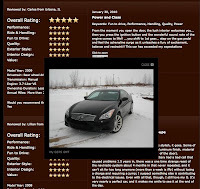 It helps customers looking to buy an Infiniti car read direct reviews from existing Infiniti owners. Moreover with social networking becoming the buzz word among auto dealers its a great way of proving credibility and increasing online presence. Thanks for the comment Dexter. I agree it is a healthy practice and a great way for dealers to show owner response to Infiniti's products. I would personally love to see how many people visiting the site view and spend time on the Consumer Reviews section. I guess I can cross this off my list of future postings - you beat me to it! OEMs have been so tentative to put anything related to user generated content on their sites that Infiniti's decision certainly stands out. They reviews lend some degree of authenticity or at the very least, non-corporate speak about why the vehicles are so great. I expect others to eventually follow suit, but in a similarly controlled manner. Thanks for sharing your thoughts. Also glad I can make your job easier now that you have one less article to write.